Yesterday, on the heels of swearing in Jeff Sessions as Attorney General, Trump signed three executive orders that bolster, back, and expand the authority of law enforcement and policing in the U.S. Trump’s three executive orders are “fully and totally” supported by the Fraternal Order of Police, the largest police union in the country with more that 330,000 cops in its membership, clearly demonstrating whose interests are being served. Trump and Sessions chose to use lies about the “threats of rising crime,” in order to claim that these latest executive orders are about protecting the “health and safety of America.” However, in September 2016, the FBI showed in its latest Crime in the United States report that crime rates overall remain at historic lows and that violent crime in particular is 16.5% lower than a decade ago. And, even then, we know policing is not a solution to what they call crime, nor does it ever increase healthy and safety. 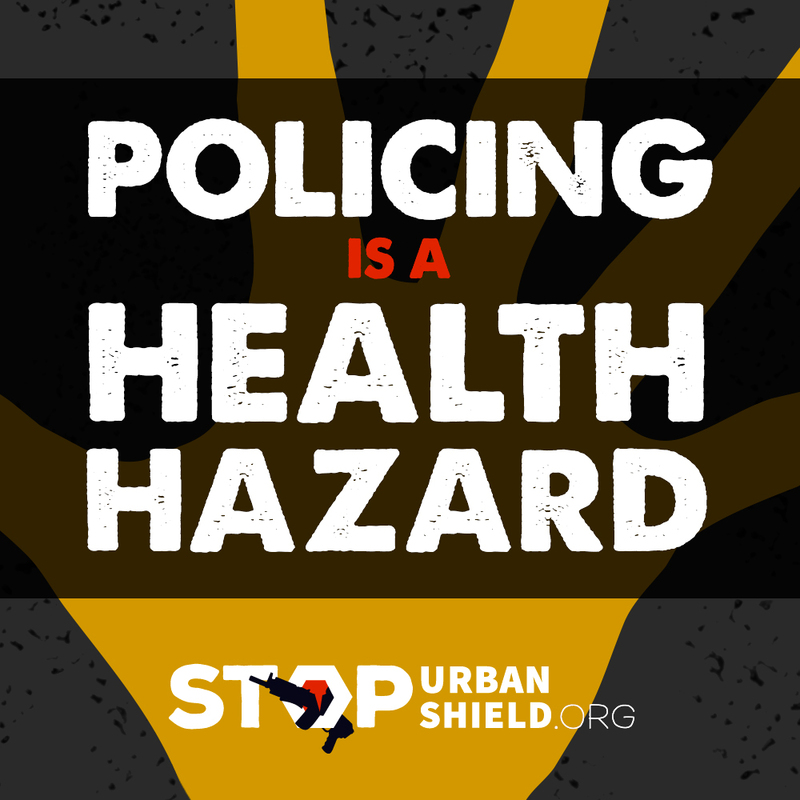 Despite the lies of Trump, Sessions, and the Fraternal Order of Police, we know policing itself is a health hazard and an inspiring, broad movement has been mounting to fight it. Last year, the APHA passed a milestone policy statement entitled “Law Enforcement Violence as a Public Health Issue.” The statement abstract puts it clearly: “Harassment and violence by law enforcement officers result in deaths, injuries, trauma, and stress, which disproportionately affect people of color and other marginalized populations such as immigrants, individuals experiencing homelessness, members of the LGBTQ (lesbian, gay, bisexual, transgender, queer) community, and individuals with mental illness.” The APHA statement joins growing and broad demands to decrease the violence of policing and divest from law enforcement, as it has a decades-long, if not centuries-long relationship of violence to people of color and other marginalized communities. More than 1,000 people were killed by cops in 2016. This is the tip of the iceberg of the violence of policing: the 2.3 million people who are currently imprisoned were harassed, detained, arrested and abused by police officers before being caged. An additional 4 million people on parole and probation are also living under threat and risk of interactions with police which could send them back to prison and separate them from their loved ones, communities, and livelihood. And every day, people are stopped, ticketed, fined, and humiliated by law enforcement. As many other media outlets have noted, no mention was made of these continual/repeated acts of state violence that communities are forced to endure, despite outrage and resistance. Trump’s position seeks to protect his own interests, citing the deaths of police officers who died in 2016. According to the Bureau of Labor Statistics, being a police officer doesn’t even make it into the top ten list of most dangerous jobs. Under the liberal rule of Obama, we faced a status quo that endorsed reforms that reinforced policing and did not reduce it. Now, under Trump, we instead have to fight a policing that is growing and bolstered with overt law and order enthusiasm. These executive orders will increase funding for programs that train and assist local police; increase resources for federal law enforcement agencies and federal prosecutors to further criminalize immigrants and those involved in street organizations all with the goal of putting more people behind bars. It is this same type of federal assistance to states that made possible the beginning of the growth and expansion of the Prison Industrial Complex in the mid-1960s to what we know it to be today. We hope that we can rely on the strong movements we have built and the lessons learned from the Stop the Injunctions campaign to NY’s efforts to delegitimize Stop and Frisk as we seek to curb this escalation in policing. We know that these actions will impact our communities: materially, emotionally and socially. We remain resolute in our commitment to resistance. We look to you all, our comrades, allies and partners in struggles, to strengthen our way forward. As the enemy is attacking on many fronts, we must back each other and deepen our commitment to the struggle against policing and white supremacy. See CR’s “Origins of Policing” timeline, which we created for our Abolition of Policing workshop, linked here for an in-depth look at the roots and ideology of policing. Understand how Trump’s Executive Orders are part of the Prison Industrial Complex (diagram and text below). Read up: Policing the Planet: Why the Policing Crisis Led to Black Lives Matter and more, here. Looking at our diagram of the prison industrial complex, a visual designed by CR-Los Angeles, we see how the sets of interests in the middle (politicians, governments, law enforcements, unions protecting the violent, coercive State arms such as guards and police) are driving and benefitting from these orders. These orders and Trump’s regime are empowered by racism, xenophobia, sexism, capitalism, and homophobia. They are using the tools of policing, criminalization, social control, the media, militarization, courts and prisons. Trump and Sessions are rolling them out as a response to social problems and political dissent. Given that policing is not a neutral set of relationships, we know (both historically, theoretically, and from living in our current moment) that orders to increase and strengthen policing will have a violent impact on people of color, immigrants, poor people, young people, queer people, women, and political dissenters. 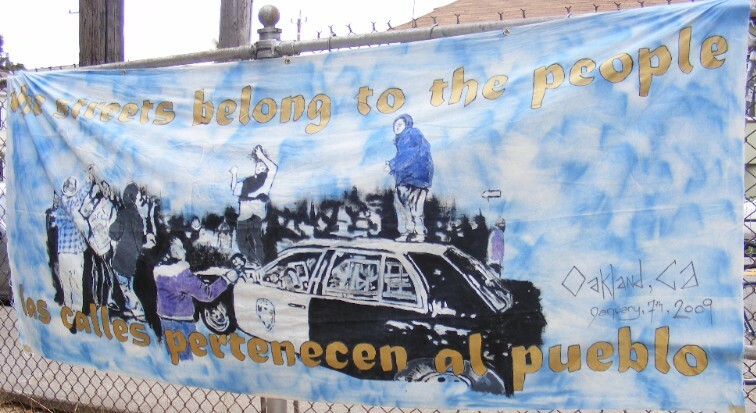 Increases in policing produces these results: insecurity; broken families and occupied communities; divestment of public resources for education, health, recreation, housing; disenfranchisement for communities targeted by policing and courts; fear and hatred; more inequality; more racism; more human rights abuses; more violence; public debt as the militarized state redoubles itself; and environmental injustice. 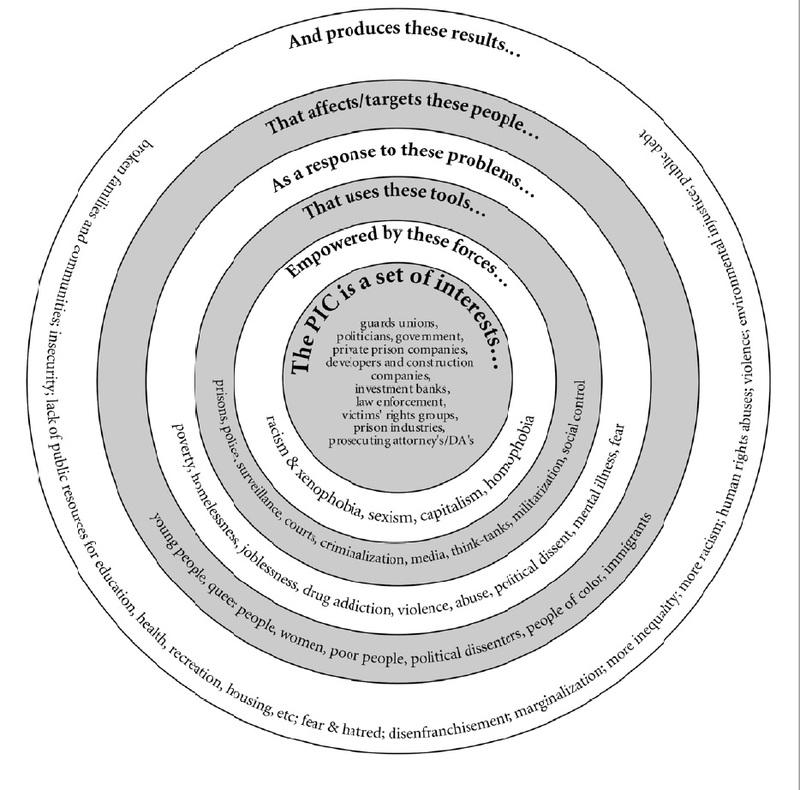 Download the Prison Industrial Complex Concentric Circles Diagram here. If you re-use it, please credit CR-Los Angeles.